Nature is alive! please take part to our survey! Are you a plant scientist? …we need your help! (1) A current or recently completed master/PhD student whose study is related to plants. (2) An undergraduate/bachelor degree that was in the biological science field. 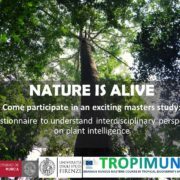 Any working individual that studies plants in all disciplines are invited (including ethno- anthro- plant-related studies). http://www.linv.org/wp-content/uploads/2014/09/logo_5.png 0 0 Camilla Pandolfi http://www.linv.org/wp-content/uploads/2014/09/logo_5.png Camilla Pandolfi2019-04-01 16:40:182019-04-08 11:05:39Nature is alive! please take part to our survey! Nature is alive – take part to our survey!